Introducing the nitro 4 wheel walker. It has been designed to be modern looking and to have features that will benefit a wide range of users and disabilities. If you are looking for a four wheel walker with seat, the Nitro should be your starting point. It has a range of excellent features and feedback from customers that goes to show its excellent reliability and popularity. The large stylish shopping bag adds another level of appeal to this amazing rollator, the zip bag is large enough to carry a small amount of shopping comfortably. The 10″ wheels at the front of the nitro 4 wheel walker will mean that maneuverability is greater than other walkers. Add to this the fact that the wheel are on forks, you will be able to turn on a sixpence. The handles are adjustable between 85cm and 97cm to suit a range of users. The handles also have locking brakes. The walker has a weight limit of 21st and has a re-enforced cross brace underneath for extra stability when in use. The nitro four wheel walker with seat can be folded when not in use, just be sure to remove the shopping basket before doing so. The easy folding action enables the user to store the walker when it is not in use. A small clip is attached to the walker to keep the walker folded. To my surpise, the walker arrived fully assembled so it was usable straight out of the box. At just 10kg, it will be easily lifted and moved. Please follow the button below or the image of the top of this article to find more product specifications. 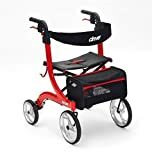 Where to buy the Nitro four wheel walker with seat? We recommend taking a look at our list of the best walkers. Our pleasure Julie, glad Mum likes it. thanks for the review, the nitro walker really is very, very good. I was quoted over £50 more in a mobility shop. Hi Joan. I am glad that the Nitro 4 wheel walker has been a good buy for you. It is our number 1 recommended walker for good reason.